This HEAVY DUTY hand operated manual FEEDWHEEL strapping tensioner with brake nose is designed to tighten 19m to 32mm Steel strapping (up to 0,9mm thick)around both flat and circular objects. 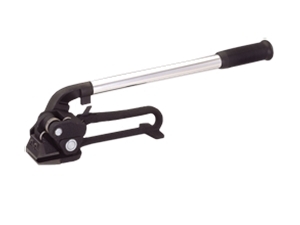 The gripping feedwheel allows the operator to achieve greater tension than a rack type tensioner. Designed for use with steel seals, a crimper and cutter. This sturdy tool is used extensively in the packing and shipping industry and recommended for medium to heavy duty applications.